Is Mongolian Barbecue Really From Mongolia? In short, no. Mongolian barbecue isn’t from Mongolia, and it’s not really even barbecue, since it’s not cooked low and slow. Mongolian barbecue should really just be called Taiwanese grilling. 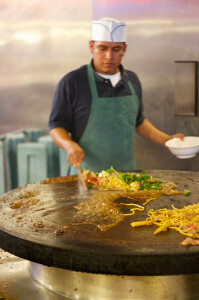 Mongolian barbecue first arrived in Taipei in 1951, where meats were stir-fried on large round griddles. This style of cooking was evocative of Japanese teppanyaki, which was also popular in Taiwan at the time. It was merely marketing that caused the Taiwanese to call this cooking method Mongolian barbecue. The first Mongolian barbecue restaurant in downtown Taipei, Ghengis Khan Mongolian BBQ, opened in 1976. As the trend became more popular, Mongolian barbecues were introduced to the west. Diners typically choose from a buffet of thinly-sliced meats and vegetables, and once their selections have been made, they are brought to a cook. Since the griddle is so large, several meals can be stir-fried simultaneously, separated by large wood dividers. The orders are customized with sauces, eggs, and sometimes tossed with oil and water. Some Mongolian barbecue chains claim the history dates back to soldiers of the Mongol Empire, who would gather large quantities of meats, spear them with their swords, and use their overturned shields to cook the meats. In fact, true Mongolian food is largely influenced by bordering Chinese and Russian cuisines. And because of the region’s extreme temperatures, vegetables are almost entirely absent from the Mongolian diet. Mutton and horsemeat are common, retaining a high concentration of animal fat, and are often served in dumplings, soups, or noodle dishes. True Mongolian barbecue is prepared in a sealed jug among hot stones and only on special occasions. Despite its inaccurate name, Mongolian barbecue is nonetheless delicious. Many restaurants are all-you-can-eat and offer a huge variety of choices from which to build a great meal. 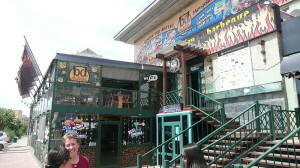 BD’s Mongolian Grill, an American chain headquartered in Royal Oak, Michigan, even opened up a location in Ulan Bator, Mongolia in 2005.